The recession is over, so say the number crunchers that look at some numbers on a page and tell us that there’s growth, people are spending and there’s some job creation. But talk to real people and they will tell you that the cost of the weekly shopping is growing, and they are earning less than they did last year. With all the politicians fighting among themselves for party position I’m wondering who is running the country. Never the less we are all buying cars, and eco cars at that. It seems Ireland has fallen in love with diesel cars and low Co2, because of our strange tax system big engine diesels are often cheaper to tax than small petrol car. Ford dealers are jumping for joy as they hold the top two spots for car sales this year so far. The Focus and Fiesta are the most popular cars followed by the VW Golf and Renault Megane. The most telling number in the list of new car sales is 62% diesel, that’s a whopping 37,108 new diesels on Irish roads. Do you think the price you pay at the diesel pump will change? It’s another diesel I’m testing this morning, a bronze coloured Mazda 6. Mazda has always made honest, reliable cars and in the last few years the design has gotten better. It was always very Japanese in looks and the 6 is no different, it looks a little like a Manga cartoon, there’s a lot going on in both the headlights and rear light clusters. It’s not a bad thing, it makes the car look a little sporty, it’s just not to everyone’s taste. Lots of chrome touches on the exterior just enhance that sporty air. The boot space is good too at 519ltrs it’s not class leading but big and square, the boot opening is that same oval shape you find on most saloons. The cabin is light open, there’s great visibility from all sides. On the dash everything is simple, just 2 big buttons controlling the air flow and a couple more for the radio, those same controls are on the steering wheel, even the temperature can be controlled without taking your hands off the wheel. There’s a little pop out screen at the top of the dash that tells you the radio station and desired temperature, it manages to be in your eye line without getting in the way. The plastics used in the cabin are solid, nothing squeaked or rattled. There’s plenty of room in the back, I had a good 4 inches when sitting behind the drivers’ seat. The bench is broad enough for 3 adults but it does lack a little headroom. The whole interior feels put together like a Japanese Mondeo, and there’s a reason for that. Ford own Mazda so some of the underpinnings come straight out of the Mondeo, Mazda took all the good points from the Mondeo and made them a little more Asian, it works too. When I started the engine the air con was on full, it was like a gale force wind so no complaints there. After I turned it down to a light breeze I couldn’t hear the engine, I thought it had cut out, but it was just that quiet, even from cold. Pulling away I found the clutch has a big return spring, it nearly pushes your foot off the pedal, which took a little getting used to. The 2.0ltr 147bhp engine has a lot of torque, 184nm may mean nothing to some of you, but it will move the car quickly. The soft seat and firm suspension is a joy, on the straights everything feels solid, and at motorway speeds there was a little wind noise. Once you’re on the smaller roads the 6 comes alive, there’s plenty of grip and the lovely 6 speed gear box means you can find the right gear easily. The steering is weighty enough so you can feel your way through the bends, kissing every apex nicely. Around the town its predictable and soft, no problem with my speed bump test here, a light clutch and snappy gearbox made progress easy. I know the reason I like this car so much, it reminds me of the Mondeo. There are only two reasons for not liking the Mazda 6, that sloping roof line making the head room in the back a bit tight and the badge. Mazda just hasn’t got the premium badge to compete properly in this sector, but then it never cultivated the European look like all the rest of them did. In terms of space, performance and handling there’s little to choose between the 6 and the class leader Mondeo. There isn’t exactly a glut of 6’s on the 2nd hand market, but the ones that are there tend to be cheaper than a Mondeo. Out of all the cars I’ve tested in this sector namely the Octavia, Insignia, Passat, Mondeo and the Mazda 6 it’s still the Mondeo I would buy with my own money, there’s just nothing to beat it yet. It can do anything you need to do in a car, all wrapped up in a mature but stylish exterior and you have a winner. 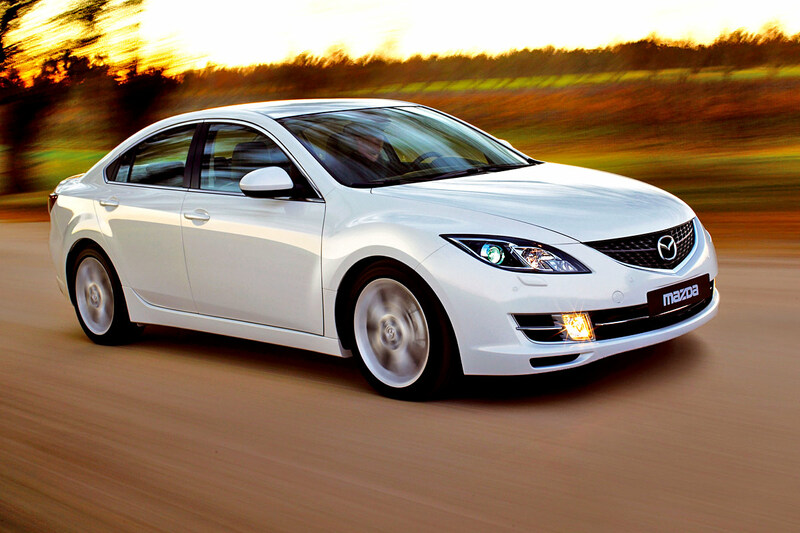 But if you like everything about the Mondeo except the looks then the Mazda 6. With thanks to Downey’s Auto stop Portlaoise for lending me the car for a test, the Mazda 6 I drove is for sale on Carzone.